The Auckland ferries are fantastic way to enjoy the beauty of the region and visit the islands of the Hauraki Gulf. It's just a 12 minute ferry ride to the popular seaside suburb of Devonport which enjoys the sightseeing spots of Mount Victoria and North Head Scenic Reserve. 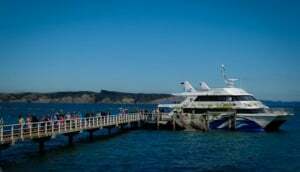 Regular ferry trips to Waiheke Island and its many wineries, and the dominant Auckland landmark of Rangitoto Island are available with both trips taking less than 40 minutes. Head to the Ferry Terminal on Quay Street to get information on the different ferry options and book your ticket.